Until now, there was no single standardized regional segmentation method of planar lung perfusion scan. 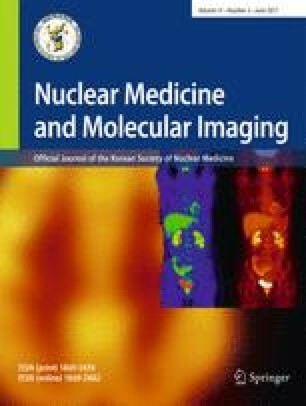 We compared planar scan based two segmentation methods, which are frequently used in the Society of Nuclear Medicine, with reference to the lung perfusion single photon emission computed tomography (SPECT)/computed tomography (CT) derived values in lung cancer patients. Fifty-five lung cancer patients (male:female, 37:18; age, 67.8 ± 10.7 years) were evaluated. The patients underwent planar scan and SPECT/CT after injection of technetium-99 m macroaggregated albumin (Tc-99 m-MAA). The % uptake and predicted postoperative percentage forced expiratory volume in 1 s (ppoFEV1%) derived from both posterior oblique (PO) and anterior posterior (AP) methods were compared with SPECT/CT derived parameters. Concordance analysis, paired comparison, reproducibility analysis and spearman correlation analysis were conducted. The % uptake derived from PO method showed higher concordance with SPECT/CT derived % uptake in every lobe compared to AP method. Both methods showed significantly different lobar distribution of % uptake compared to SPECT/CT. For the target region, ppoFEV1% measured from PO method showed higher concordance with SPECT/CT, but lower reproducibility compared to AP method. Preliminary data revealed that every method significantly correlated with actual postoperative FEV1%, with SPECT/CT showing the best correlation. The PO method derived values showed better concordance with SPECT/CT compared to the AP method. Both PO and AP methods showed significantly different lobar distribution compared to SPECT/CT. In clinical practice such difference according to different methods and lobes should be considered for more accurate postoperative lung function prediction. Minseok Suh, Yeon-koo Kang, Seunggyun Ha, Yong-il Kim, Jin Chul Paeng, Gi Jeong Cheon, Young Tae Kim, Samina Park, Dong Soo Lee, E. Edmund Kim, and June-Key Chung declare that they have no conflicts of interest. The original article was approved by an institutional review board (IRB No. 1605-040-760) and has been performed in accordance with the ethical standards laid down in the 1964 Declaration of Helsinki and its later amendments. The institutional review board waived the need to obtain informed consent from the patient. Details that might disclose the identity of the subject were omitted.